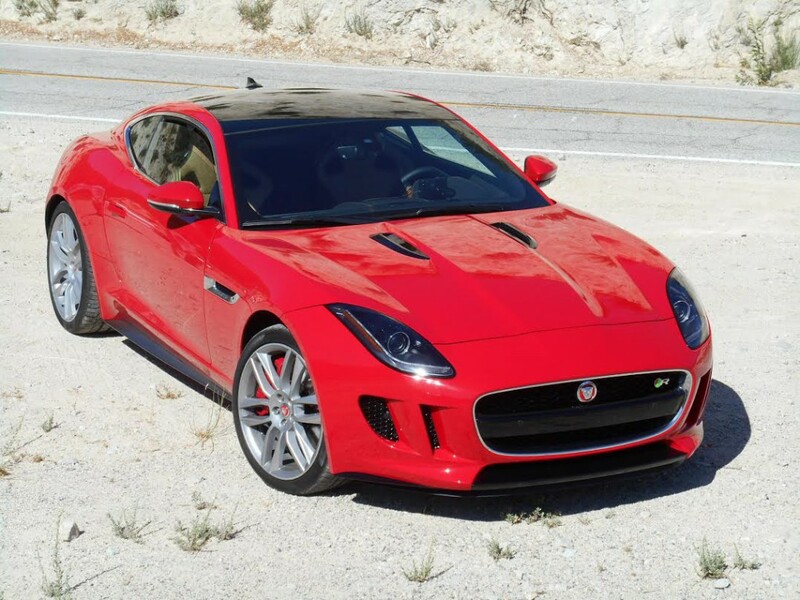 The 2015 Jaguar F-Type is shown here with the available glass roof. It’s been a while since Jaguar has built a true sports car. Despite the fact the company made its name in this country with the svelte XK roadsters of the 1950s and sensuous XKEs of the ‘60s and ‘70s – all of which were serious sporting machines in their day — Jaguar’s “sports cars” of the past 40 years have (with the exception of the short-lived, mid-engine XJ220 exotic of the early ‘90s) really been rather large, luxury-touring 2+2s. Until now. Based on the C-X16 concept car shown in Frankfort in 2011, the new F-Type is a sports car in the purest sense of the term. Both the convertible – which was introduced last spring – and the new coupe are relatively small, aluminum-bodied two-seaters with prodigious performance potential. In the Jaguar tradition, the F-Types are really luxury sports cars with a price to match. The lineup starts somewhat north of Corvette money, as the base model lists for $65,000, while a fully optioned top-line version closes in on twice that. Though some may find the interior a bit bland — and many controls a bit tedious to use — material selection matches the F-Type’s price point. Note that this photo depicts a convertible version, but the coupe is the same. Both the coupe and convertible are offered with a pair of supercharged 3.0-liter V6s or a supercharged 5.0-liter V8, all linked to an 8-speed automatic transmission. This report will cover the new coupes, which come in three variations and are leaping off dealer’s lots as we speak. First, let’s go through some pertinent figures, all supplied by Jaguar. Conveniently mounted on the console for quick and easy access are the “Joy buttons.” One turns off the traction control, the other opens restricters in the exhaust to amplify the F-Type’s glorious song. In most ways, standard and optional features are about what you’d expect at these prices, with a couple of exceptions. S and R models can be optionally fitted with high-performance ceramic-disc brakes, which Jaguar says are specially designed not to squeal when cold as many of the ilk are wont to do. Also, the F-Type introduces Jaguar’s new In Control, which links apps from your smart phone to the car’s controls and 8-inch touch screen. On the down side, cooled seats are not offered, and in a rather odd move, a rearview camera – which is sorely needed due to poor rear-corner visibility in both body styles – is not standard, but rather optional. 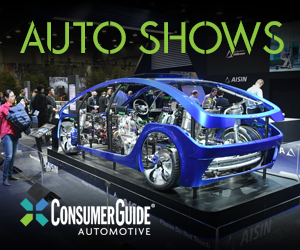 On a recent preview drive of the coupes in Los Angeles, a number of impressions stood out. From an accommodations standpoint, taller folks might find the car a bit awkward to get into due to the low seating position and rather wide doorsills, but very comfortable once situated. There’s not a huge amount of head or leg room, though all but the tallest drivers should fit. Most surfaces are padded, and while the overall look is more business-like than flashy, materials are top-notch. The dashboard layout is a mixed bag. Tucked away at the far left of the instrument panel is the 200-mph speedometer, which leaves the “legal” numbers in a dark corner that’s tough to decipher while wearing sunglasses. Audio controls are easy enough to figure out and reach, but most adjustments are done through a touch screen – which inevitably demands additional steps to perform simple functions – and the on/volume knob is inconveniently located on the console. Climate controls consist of simple rotary knobs for temperature and fan speed, but mode is adjusted by hitting a button that takes you to a page on the touch screen, from which you then select which outlets are activated. This last is overly tedious, though it does allow you to select lower, dash, and defrost settings, where usually you can’t have defrost and dash together. Interior storage is a bit better than in some sports cars, though no match for your average sedan. There’s a modest glovebox, a tiny console box with Aux, USB, and 12-volt plugs, two covered cupholders, a hard-to-reach bin between the seat backs, and small map pockets in the doors. 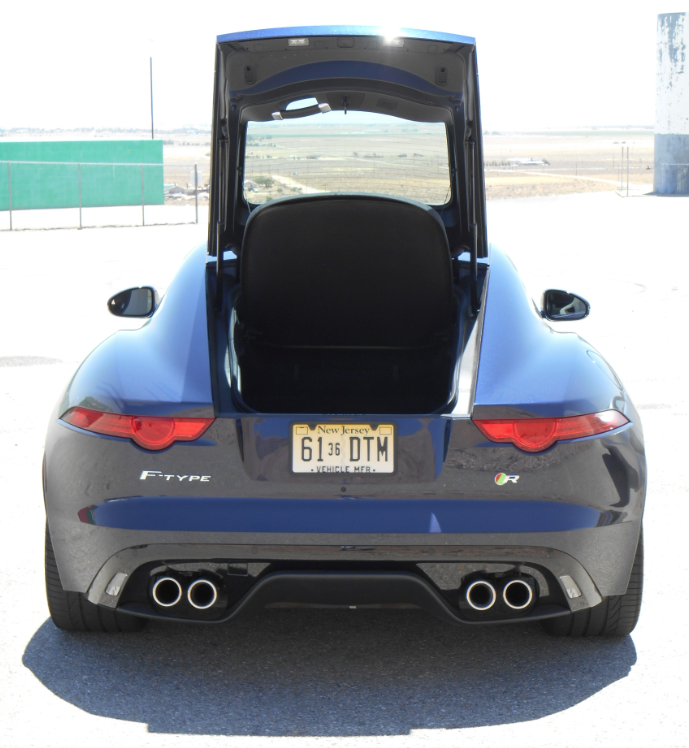 Though the opening to the cargo area in back is quite narrow, space under the hatch lid is impressive for a sports car, and Jaguar says two sets of golf clubs will fit inside. Furthermore, there’s a deep well under the floor that’s great for hiding items from prying eyes. From the driver seat, visibility is reasonably good to the driver-side front corner, but on the passenger side, the roof pillar combines with the rearview mirror to block a lot. Thick, angled rear pillars leave the rear corners as huge blind zones, and the narrow window and high tail restrict the view straight aft, with only the latter being completely countered by the optional rearview camera when backing. 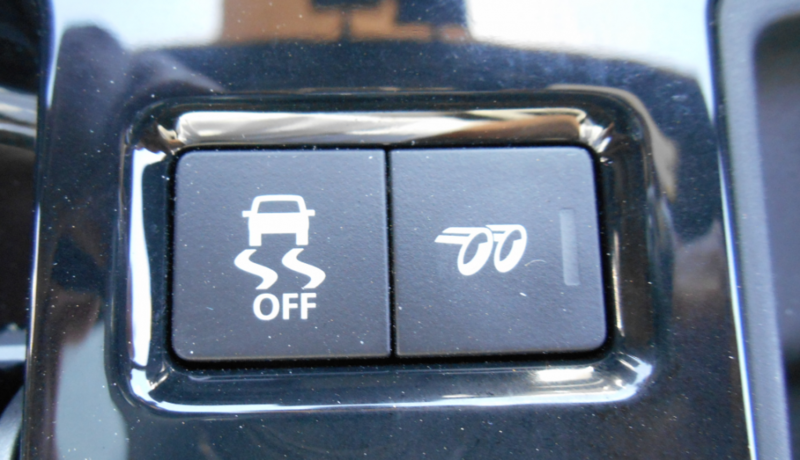 (Rear obstacle detection is also available.) By contrast, visibility to the sides is about as good as it gets due to having no side pillar. An odd oversight is that the thin sun visors don’t rotate to the sides to cover the side windows. The cargo opening may be narrow, but the area it reveals is quite wide and deep; Jaguar says it will hold two sets of golf clubs. There’s also a handy under-floor bin for valuables. But a sports car is really about dynamics, and here the F-Type excels. Handling and steering feel are of a high order, the former being aided by an available automatically adjustable suspension that provides flat cornering with a reasonably comfortable ride. Most notable from a handling standpoint was that the F-Type remained unusually composed in bumpy corners, with little of the sideways hop that afflicts most cars in that circumstance – something that added much-appreciated reassurance during our quick drive on curvy mountain roads …with very steep drop-offs. Power was impressive in the S we drove but downright neck-snapping in the R (which launched from a stop as if it were fired out of a cannon), and in both cases, it flowed in a smooth, linear rush. Particularly noteworthy is that the automatic transmission downshifts with lightning speed, even under part throttle. Steering-wheel shift paddles lend a sporting touch and were a boon in the tight twisties of our drive route, but with eight gears to go through, downshifting from “cruising” eighth to corner-carving second requires flipping the lever six times. And keeping count. But perhaps the F-Type’s most enticing trait has nothing whatsoever to do with performance. While the supercharged six certainly makes nice noises, the V8 produces a gloriously rorting rip under acceleration and a raucously burbling pop under deceleration that isn’t matched by any car south of $200 grand. It’s virtually impossible to resist prompting one or the other, and that goes double when driving through a tunnel or next to a wall. It’s simply … intoxicating. Calvin Klein, forget Eternity. Just bottle this. As the spiritual successor to the legendary XKs and XKEs of Jaguar’s storied past, the F-Type certainly has some big paw prints to fill. 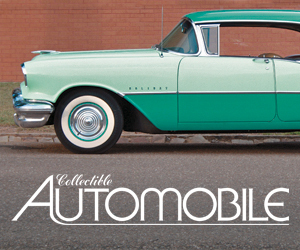 But in both performance and appearance it does so admirably, and may well become a coveted classic in its own right. Written by: Rick Cotta on July 1, 2014.